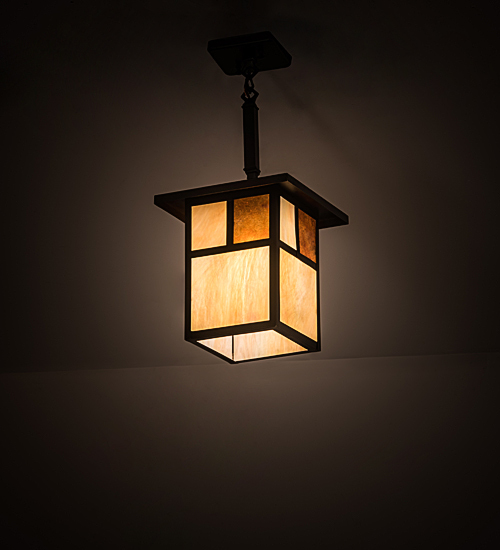 Description: Handcrafted from Solid Brass, this Craftsman Signature Pendant is inspired by the Arts and Crafts movement. The striking Mission straight line design is featured in a Beige Iridescent art glass shade with Amber Mica accents, and enhanced with a frame and hardware finished in a handsome Craftsman Brown. Handcrafted by highly skilledartisans in our 180,000 square foot manufacturing facility in Upstate NY. Custom sizes, styles, colors and lamping options are available. The 9-inch square fixture is UL and cUL listed for dry and damp locations.